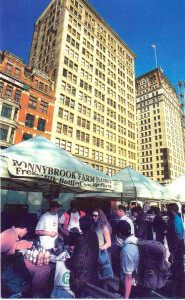 Ronnybrook Farm Dairy is proud to sell at New York's Greenmarket. A program of the Council on the Environment of NYC, Greenmarket promotes regional agriculture and ensures a continuing supply of fresh, local produce for New Yorkers. Greenmarket has organized and managed open-air farmers markets in NYC since 1976. By providing regional small family farmers with opportunities to sell their fruits, vegetables and other farm products to New Yorkers, Greenmarket supports farmers and preserves farmland for the future. Below you fill find an overview of the Greenmarket program. For more info, be sure to visit the Council on the Environment of NYC website. Who can sell at Greenmarket? Only regional growers may sell at Greenmarket. Middlemen or brokers are not allowed. Regional farmers who produce fruit, vegetables, fish, meat, eggs, dairy, honey, maple syrup, plants and other foods sell at Greenmarket. Comprehensive regulations govern what may be sold at Greenmarket. With few exceptions, all items must be grown, raised, foraged, caught, or otherwise produced by the seller. How are rules enforced? Greenmarket staff routinely visit growers to make sure that what they sell at market is grown in their fields and ensure product integrity. The Farmer Consumer Advisory Committee (FCAC), composed of Greenmarket growers and consumers, assists Greenmarket in rule enforcement and policy formulation. Markets are held in parks, playgrounds, parking lots, sidewalks, closed streets and other available open spaces. We endeavor, with community support and assistance, to find spaces that give the markets room to grow and are visible to community residents. See the market listings map for a current listing of our locations. Most markets run one day a week, rain or shine; some run twice weekly. Our largest, at Union Square, operates four days a week. Some of our markets are open only for the growing season, July through November; some locations are open year round. Close to 175 farmers and producers attend our markets, generally around 8 to 12 in any one market. At our largest location, Union Square, as many as 70 growers attend in peak season. Farmers pay a fee to sell at Greenmarket. The fee depends on location and display size. Grants and contributions are gratefully received from individuals, foundations and corporations. Greenmarket is a program of the Council on the Environment of New York City, a privately funded citizens organization in the Mayor's Office. Barry Benepe founded Greenmarket in 1976. Director Tom Strumolo and Greenmarket staff are responsible for market operations, farm visits, publicizing markets, securing permits, and working with community groups, city and state agencies to find new market sites and new farmers. Greenmarket offers educational tours for first through sixth grades at Union Square on Mondays, Wednesdays and Fridays in the late morning. Tours are free of charge, but must be scheduled in advance through the Greenmarket office. Tours are typically 45 minutes in duration. There must be one adult for every five children; there is a limit of 20 children per tour.